People are more connected, more in touch and more social than ever before. Much of which can be attributed to an increase in mobility. Technological advancements in devices, applications and infrastructure have facilitated a tremendous increase in our ability to send, receive, analyze, manipulate and act on information while on-the-go. But this fast-paced mobility evolution isn’t just affecting the way constantly on-the-move ‘field’ personnel operate. Primarily office-bound workers, from a multitude of backgrounds, are wholly device independent – switching from tablet, to smartphone, desktop and back to tablet throughout their day. As the professional world embraces the new realities and opportunities that multi-device business offers, the adoption rate of Mobile Business Intelligence (BI) is too set to climb steeply. The fourth installment of Dresner Advisory Services’ (DAS) Wisdom of Crowds Mobile Business Intelligence Market Study, details where mobile sits in the overall context of BI, as well as alluding to the future of Mobile BI. The progress of Mobile BI has been monitored for a number of years now, and in analyzing these findings, we are beginning to understand the state of the Mobile BI market. Through dissection of the study, we are better able to understand where Mobile BI will settle in the business ecosystem. But why are we becoming more mobile? Well, technology is advancing so rapidly, the word ‘innovative’ is becoming meaningless. A tablet is also cheaper than ever before. But, perhaps most importantly, they’re everywhere. Western cultures have embraced tablets – devices many of us originally considered to be a pointless awkward hybrid of the smartphone and desktop. They’re now everywhere. But what do we do with them? 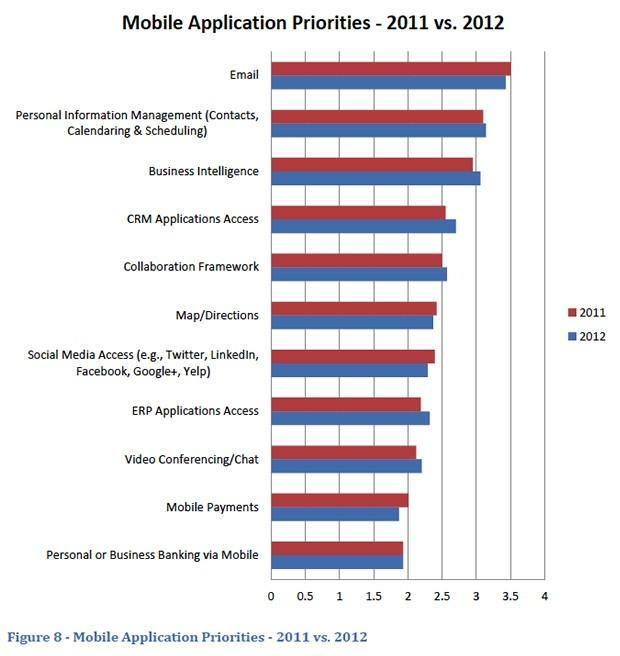 Over 2011 and 2012 the top mobile priorities were recorded within the DAS study. 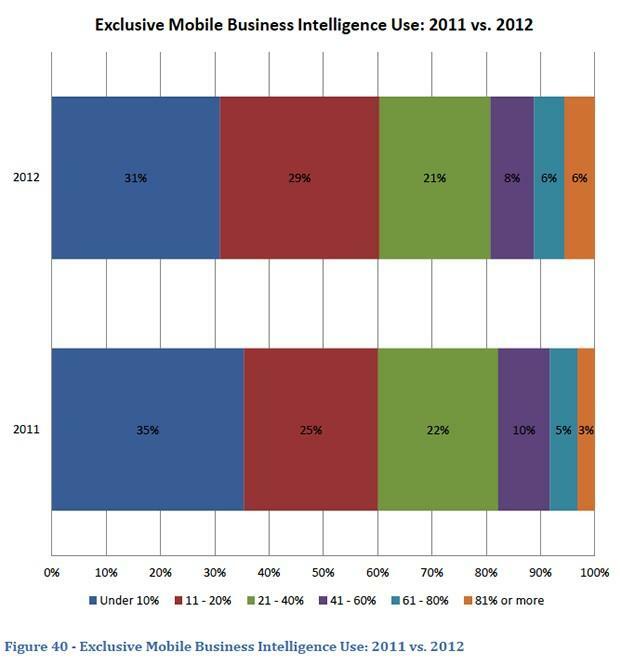 Upon examination, mobile devices were being used increasingly for the purpose of BI in 2012 compared to 2011, growing in importance from 2.9 to 3.1 out of 5 (see figure seven below). Whilst BI still ranks third behind email and personal information management (PIM), Mobile BI is on the rise, whereas email is declining as a priority, falling from 3.5 to 3.4 in 2012. We expect Mobile BI’s ascendancy to continue into 2013 and beyond, as the potential applications of the technology become fully realized. Because the proliferation of mobile device usage has made us – whether we like it or not – ‘available’ 24/7, it’s unsurprising that email is still viewed as the most important mobile application. However, the importance people place on accessing email via mobile devices is comparatively falling, as the perceived value of accessing other mobile applications, such as BI, CRM and ERP increases. 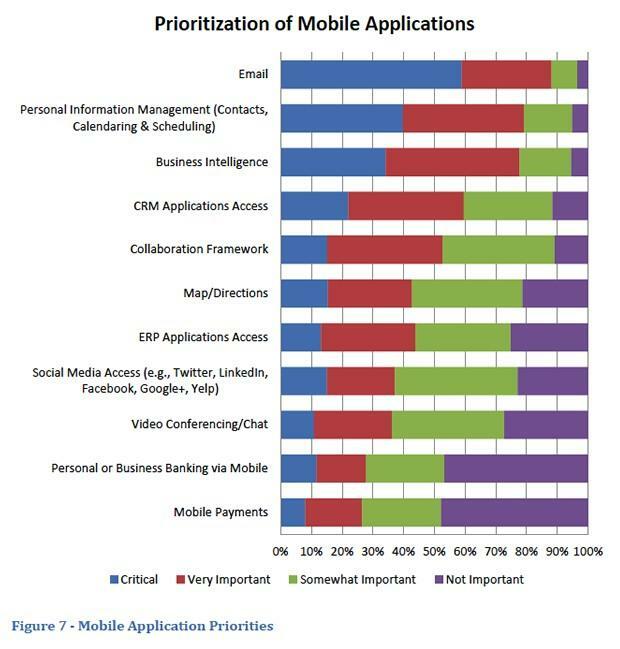 Given the enormous range of mobile applications, and the fact that many people rely on many of these applications to help organize their life on a daily basis, it’s extremely noteworthy that respondents rated BI as the third most important mobile application – only narrowly behind PIM and email apps. And, it seems that the perceived importance, and actually use, of Mobile BI is set to continue growing, as organizations begin to reap the rewards of their Mobile BI initiatives. This is also forcing laggards to catch up with their early adopting counterparts, in order to remain competitive. The hype around Mobile BI has swept up developers and consumers alike, with all parties concerned investing heavily. As shown in figure 20, this growing focus is evidenced by the increasing importance organizations are placing on Mobile BI. Mobile BI is quickly becoming classified as either ‘very important’ or ‘critical’ to business operations. Since 2010, the level of importance organizations place on Mobile BI has grown. 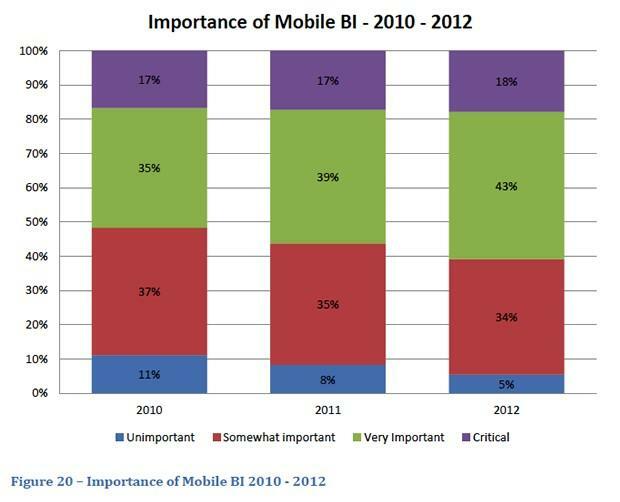 In 2010, 52% of respondents to DAS’ Mobile BI Market Study classified Mobile BI as either ‘very important’ or ‘critical’. Jump forward 24 months and, in 2012, 61% of respondents classified Mobile BI as either ‘very important’ or ‘critical’. This increasing emphasis on Mobile BI is not unexpected, given the increase in mobile devices, the explosion of BI solutions available, and growing number of resultant Mobile BI case studies validating its worth. Mobile reporting and analytics technologies are also becoming increasingly sophisticated – moving far beyond viewing simple static reports. Businesses are now capable of utilizing the full breadth capabilities offered by their core BI applications via their mobile equivalents – they’re able to filter, drill and analyze any data they have at their disposal. This improved functionality is just another factor of many, which is contributing to growing interest, deployment and adoption of Mobile BI. Mobile BI, while gaining critical momentum as a concept over the past few years, isn’t exactly new. Having first appeared in the 1990s, Mobile BI has only recently become fully recognized for the value it provides organizations. But why now? Has technology increased? Are we more informed? Is it financially viable? 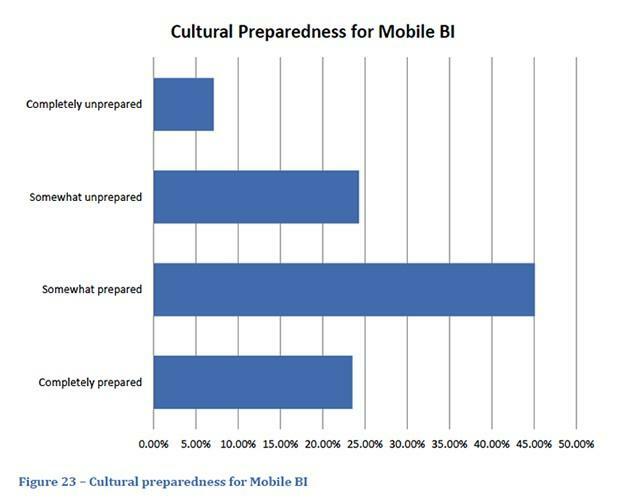 All are contributing factors for the recent uptake in Mobile BI, however, the overarching cultural preparedness of a business will dictate mobile uptake of BI software. The DAS study shows that the majority of businesses are preparing themselves for the implementation of Mobile BI, with 68% of respondents rating themselves as either somewhat or completely prepared. Only seven percent of respondents are completely unprepared. The fact that therefore 93% of organizations are at least modestly prepared for the introduction of Mobile BI indicates that the vast majority of businesses are either already utilizing Mobile BI, or are thinking of how they can implement mobile analytics to catch up with their early adopting competitors. To gain a sense of how far Mobile BI has come, the inaugural 2010 version of DAS’ Mobile BI Market Study found that 74% of respondents indicated that less than 10% of their BI users accessed BI via mobile devices. Now, only 64% or organizations provide access to Mobile BI capabilities to 10% or fewer of their BI users. More significantly, seven percent of organizations now provide access to mobile reporting and analytics to 81% or more of their BI users – no organization claimed these levels of penetration in 2010. Given the influx in Mobile BI interest and adoption over the past few years, some have questioned whether this upward trend can continue. Has this recent spike been a flare-up, simply thriving on unsubstantiated hype and business’s continual drive for a competitive advantage? Or is it a genuine game changer that’s here to stay, thrive and differentiate two competitors? If the future plans for Mobile BI are anything to go by, businesses without Mobile BI will be the minority, and at a distinct disadvantage as a result. 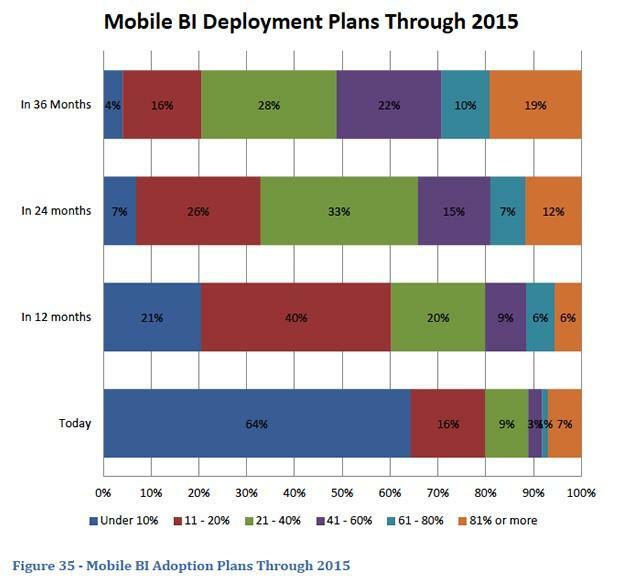 Aggressive Mobile BI expansion plans are projected. Only a mere four percent of businesses plan to deliver Mobile BI to less than 10% of their BI users by 2015. Staggeringly, 51% reported that, by 2015, at least 41% of users would have access to Mobile BI – almost five times the current penetration rate. That said, respondents to the 2010 study indicated that by the end of 2012, 84% of organizations would be delivering Mobile BI to 11% or more of their users. Today, its evident that the majority of those plans failed to eventuate, with only 36% of organizations claiming that they currently deliver Mobile BI to 11% or more of their BI users. So what does this all mean? Is Mobile BI over-hyped? A little. Is it all talk and no action? No. What these results indicate is that peoples’ plans are far more optimistic than realistic. Mobile BI penetration and adoption rates have indisputably continued to steadily rise over the past few years – this study, and many others like it, have proven that. So what’s the reality? Realistically, the interest in Mobile BI, and intent to implement, is there. But we’re unlikely to see explosive growth due to BI’s inherent complexity. However, because we seem to have reached a critical stage of awareness and acceptance of Mobile BI’s benefits, its safe to assume that many of the deployment plans through 2015 will come to fruition. 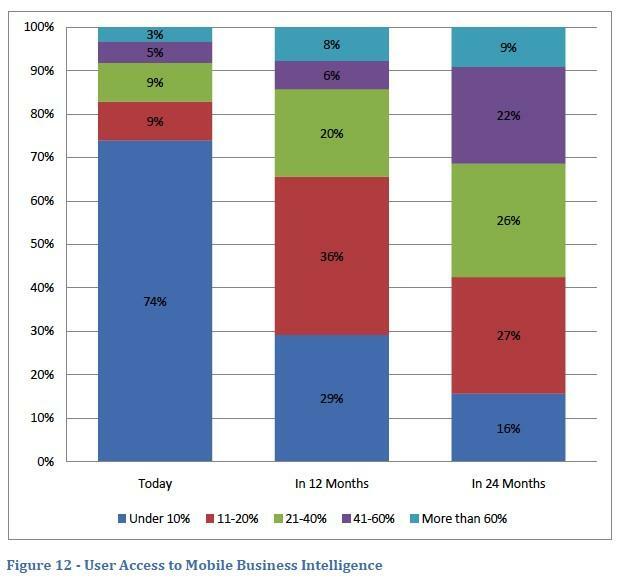 Exclusive Mobile BI usage: Is mobile access to BI replacing traditional desktop access? Perhaps the most interesting question regarding reporting and mobility, is whether Mobile BI will predominantly complement or replace more traditional desktop access to BI in the future. DAS’ past two investigations into the state of Mobile BI indicate that the number of users accessing BI exclusively from mobile devices is rising – albeit slowly. In the 2011 version of the study, 35% of respondents stated that under 10% of BI users were accessing their reporting and analytics exclusively via a mobile device, falling to 31% in the most recent version (2012). Furthermore, 20% of 2012 survey participants indicated that more than 41% of users were exclusively accessing BI content via mobile devices – a two percent increase on 2011’s findings (18%). These marginal increases seem to suggest that Mobile BI, while continuing to gain popularity and improve penetration, is unlikely to usurp desktop access, but instead be utilized as an additional gateway to BI. Although, as with future deployments, many organizations harbor ambitions plans for boosting mobile-only access to BI content. Nearly 40% of respondents said that by 2014, more than 40% of all users would use BI exclusively via mobile devices. Many key indicators reaffirm that the BI world is in a state of flux, in which Mobile BI will keep pressing its advantage, complementing and even replacing traditional BI. So truthfully, only two question remains: Are we witnessing the death of traditional BI at the hands of Mobile BI? And secondly, how are you preparing for Mobile BI?